The photos below are the completed project of a collaborative poster assignment displaying the traditional Seven Teachings. ** This classroom project is adapted from a project introduced by Wade Houle and shared at the 2012 MTS Fab 5 Conference. Why do reserve communities have less available resources than other communities of similar populations? After completing online research, as well as personal communication with community representatives, students created posters comparing available resources in two different communities of similar size. In addition to creating visual depictions, students also handed in their written research. My fiance and I created the following online portfolio, featuring over 30 resources, to support the inclusion of Aboriginal perspective into various subjects in the Manitoba curriculum. Specific reference is made to various subject GLOs, SLOs and the Integrating Aboriginal Perspectives into Curricula document. Negative treatment of Indigenous groups are often referred to as that country's "secrets" because they are not often discussed openly. Based off of the Post Secret public art project, students created post cards depicting one of these secrets. In addition to creating a visual representation, students were also asked to complete a written portion explaining the significance behind their secret choice and why they believe it should be shared with others. A central focus of traditional First Nations education involves Elders and community members passing information to younger generations through story telling. 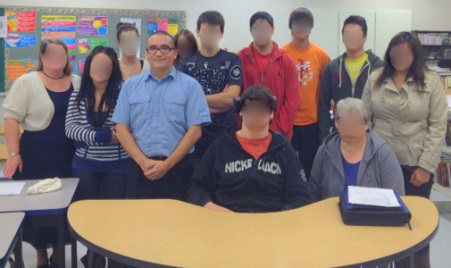 The photo below is my Grade 11 class from my 3rd Student Teaching Experience with Mark Young, a guest speaker I invited in from TRCM. Mark not only spoke about treaties but also introduced information on First Nations world view and challenges that First Nations people can encounter.